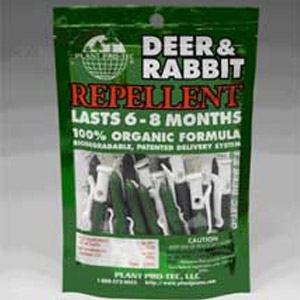 Plant Pro-Tec Deer & Rabbit Repellents discourage animals from browsing trees, shrubs, flowers, and garden plants. Plant Pro-Tec Repellents are: Effective - Repelling formulation is based on long known data that the garlic odor repels deer, elk and rabbits. 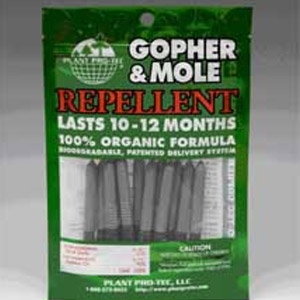 Plant Pro-Tec Gopher & Mole Repellents redirect animals away from lawns and gardens. 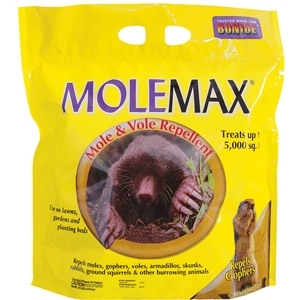 Effective: Repelling formulation is based on long known data that the sulfur compounds from garlic repel gophers and moles. For Organic Gardening. 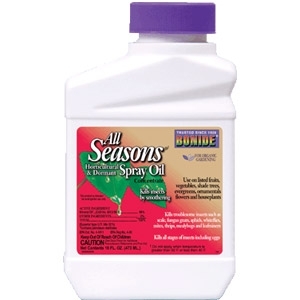 A superior type paraffinic oil that may be used as a growing season spray, dormant spray (no leaves) or delayed dormant (green tip) spray to control overwintering eggs of red spiders, scale insects, aphids, bud moths, leaf roller, red bug, codling moth, blister mites, galls, whitefly, mealy bugs and other insects and diseases. 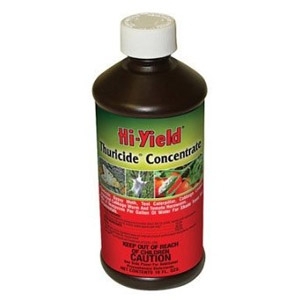 Highly recommended for use on fruit trees, shade trees, shrubs, ornamentals, roses and vegetables. Safe and pleasant to use. 1 pt/16 oz. Permethrin 0.125% An outstanding vegetable garden insecticide - killing and repelling virtually any insect pest common to home gardens. 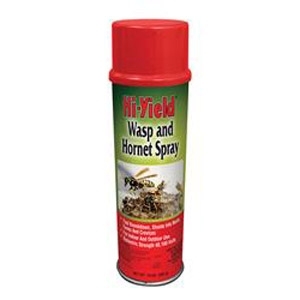 Also great for Japanese Beetles on roses & flowers. Colored green to blend with foliage! Short days to harvest intervals. 10 oz. 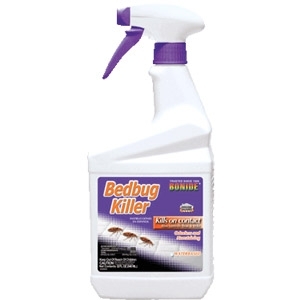 Excellent, long lasting control of bedbugs. 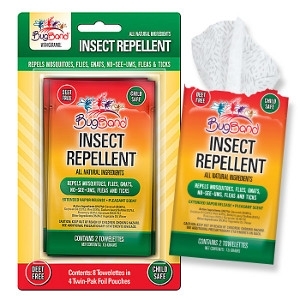 Great for travelers who want to protect their luggage from insect "pick-up" at hotels. 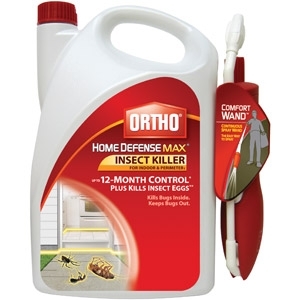 Also kills lice, fleas, ticks, clothes, moths, and carpet beetles and pantry pests. 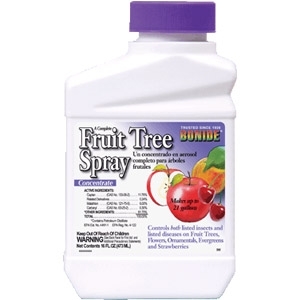 A complete liquid fruit tree spray containing Captan 12%, Malathion 6%, Carbaryl .3% and a spreader sticker. Simple to use. No plugged nozzles. As little as 1 1/2 tablespoons per application. Excellent for the home orchardist. 16 oz. 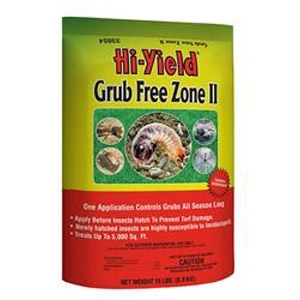 Kills White Grubs before they damage your lawn. Other pests controlled (including the larvae of Japanese Beetle, Oriental Beetle, Chafers, Asiatic Garden Beetle, May or June Beetles, and Black Turfgrass Ataenius) and Mole Crickets. Also used in landscaped areas containing flowers, ground covers, shrubs and trees. 15 & 30 lbs. 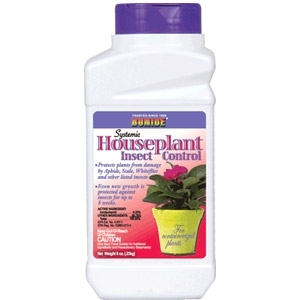 Broad spectrum residual insecticide for the control of certain insects in home lawns. 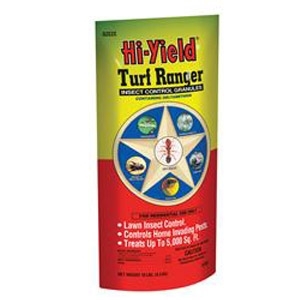 Controls: Ants, Armyworms, Chinch Bugs, Crickets, Fire Ants, Fleas, Grasshoppers, Scorpions, Spiders, European Crane Fly and others listed on label. 10 & 20 lbs. 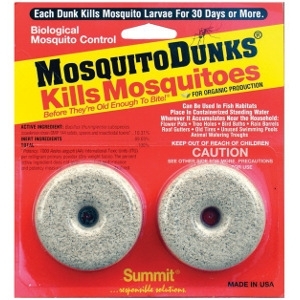 Kills Mosquitoes before They’re Old Enough to Bite!® The Mosquito Dunks are America’s best selling home owner mosquito control product. The only product with BTI, a bacteria toxic only to mosquito larvae, that lasts 30 days and treats 100 square feet of surface water. No mixing. No measuring. No mess. Just results. 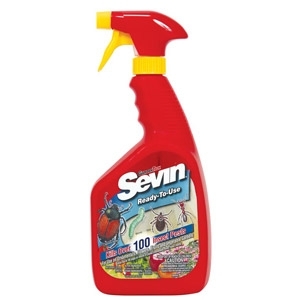 Turn your garden into a plants-only party with Sevin Ready-To-Use Bug Killer. 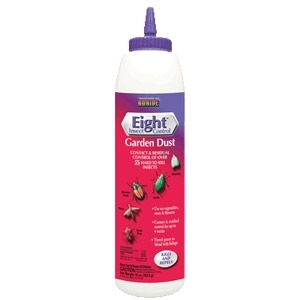 Ideal for smaller areas, hanging plants, outdoor plants, or container gardening. 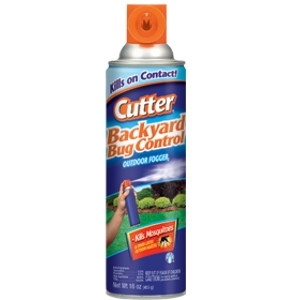 Enjoy your backyard this Summer and create a bite-free zone with Cutter Backyard Bug Control Outdoor Fogger. 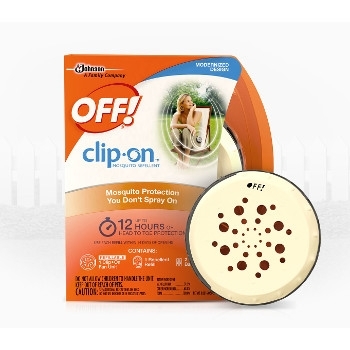 It repels and kills mosquitoes and other annoying insects. 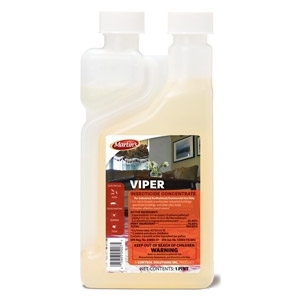 Use on fruits, vegetables, shade trees and ornamentals Controls leaf-feeding worms such as Bagworm, Elm Spanworm, Tent Caterpillar, Spring Cankerworm, Gypsy Moth, Fall Webworm, Cabbage Looper, Imported Cabbage Worms, Tomato Hornworm. 16 oz. 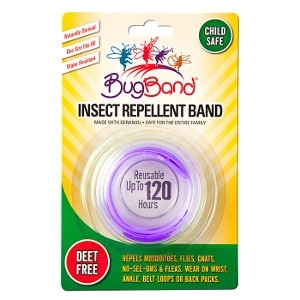 For residual pest control in and on buildings and structures and their immediate surroundings and on modes of transport. Permitted areas of use include industrial buildings, houses, apartment buildings, laboratories, buses, greenhouses (non-commercial), and the nonfood/feed areas of stores, warehouses, vessels, railcars, trucks, trailers, aircraft (cargo areas only), schools, nursing homes, hospitals (nonpatient areas), restaurants, hotels and food manufacturing, processing, and servicing establishments. Jet spray shoots into nests, eaves and crevices to provide quick knock down. Use indoors or outdoors. Die-electric strength to 40,100 volts. 15 oz. For organic gardening. 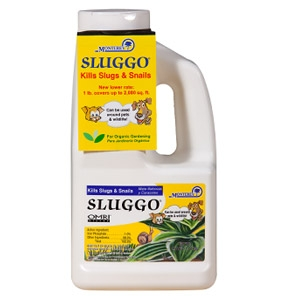 Kills snails & slugs.Can be used around pets & wildlife. Iron phosphate occurs in soil. Easy-to-use granular formulation. Remains effective after rain or sprinkling. May be used up to & including day of harvest.